I set off early as rain was forecast and also I had decided not to pay an extra £6.50 for a continental breakfast. Another hot and sticky day. It was a pleasant cliff top walk past the Northern end of the Quantock Hills. Just as I was approaching the end of the road from the village of Kilve I saw a tent pitched near the edge of the cliff. Sat with his head poking out was Seaside Steve (this is his trail name). 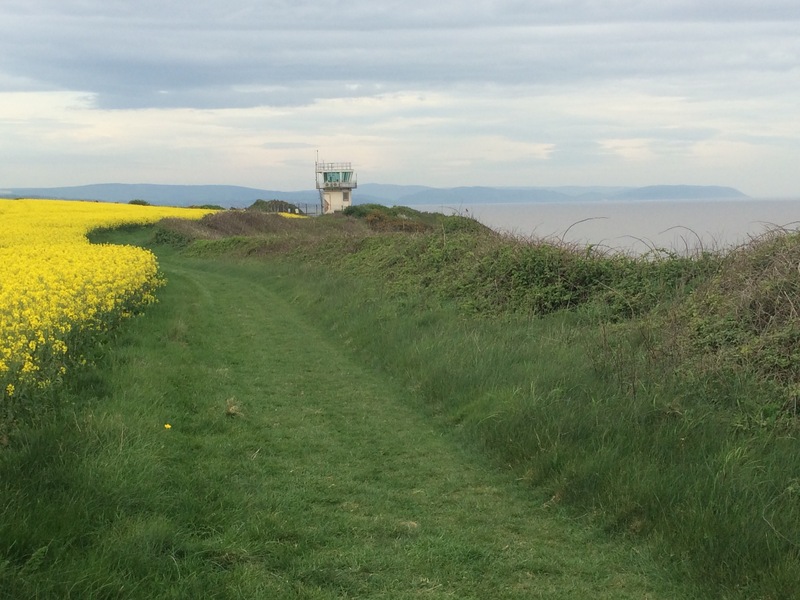 He was walking the “trail” from Brean to Poole, so the whole SW Coast Path plus a bit. He had bad blisters so had decided to rest up for a couple of days near Kilve. Seaside Steve wild camps every night and takes his time walking (he expects to take 100 days to walk <700 miles so that is quite slow going) but he clearly enjoys it. He identified with me as a fellow trail walker, although I didn’t mention that I use campsites, hostels and B&Bs rather than wild camp. He told me about Trail Angels (people who help us on the trail) and Trail Magic (whenever you really need something it often appears). Had I not read Cheryl Strayed’s book, Wild, about walking the Pacific Crest Trail, I might have thought Steve a bit mad but I decided either he’s an experienced trail-walker or he’s read the same book. Anyway, I may not be a proper trail-walker but I have definitely met lots of Trail Angels and been on the receiving end of a bit of Trail Magic. Seaside Steve also provided me with some tips on getting water on the trail (churches and the cistern-end of animal water troughs were his favourites) and a post card of himself that he normally sells to people he meets, but it was free to a fellow trail-walker. 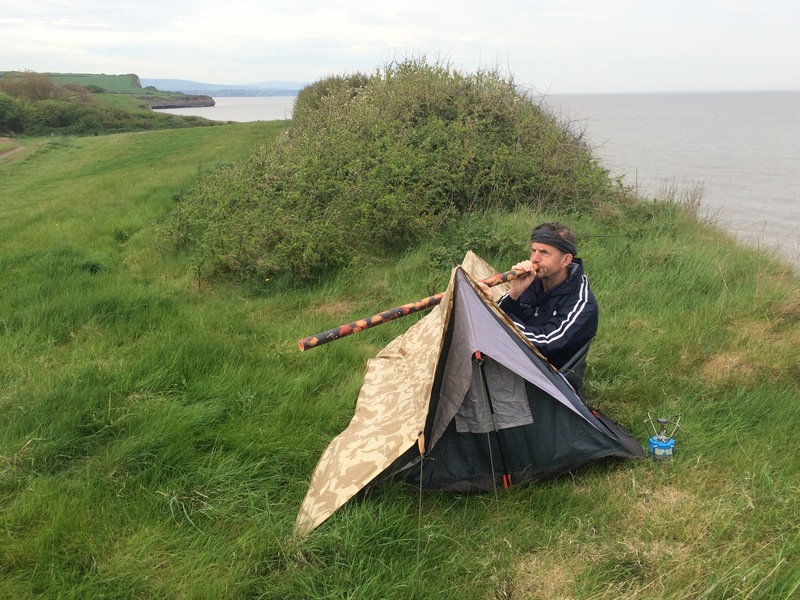 He then played me a tune on his homemade didgeridoo. He made a really good sound from a piece of plastic piping that he had carefully painted in Aboriginal colours. What a character; I walked on with a big smile. 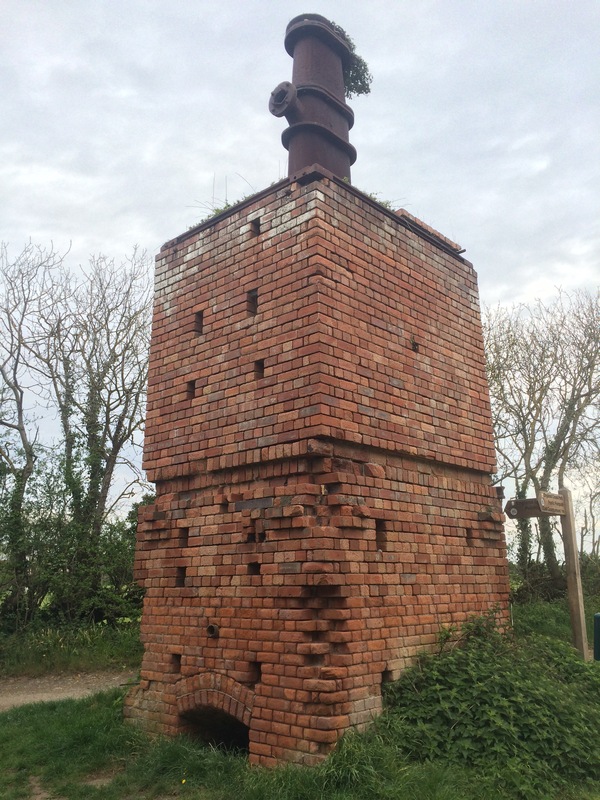 At the end of Kilve Pill was a brick chimney with what looked like an iron funnel atop it. This was an oil retort that had been built in 1924 to convert shale to oil; unfortunately it was found to be not commercially viable. 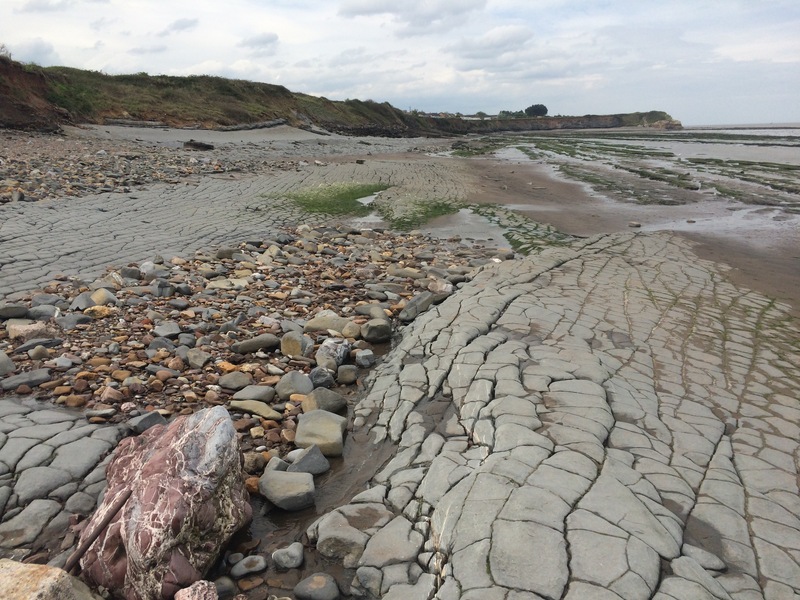 Fortunately the tide was heading out so I was able to take the path around St Audrie’s Bay with only a 10 minute wait for the water to recede far enough for me to get around the rocks. 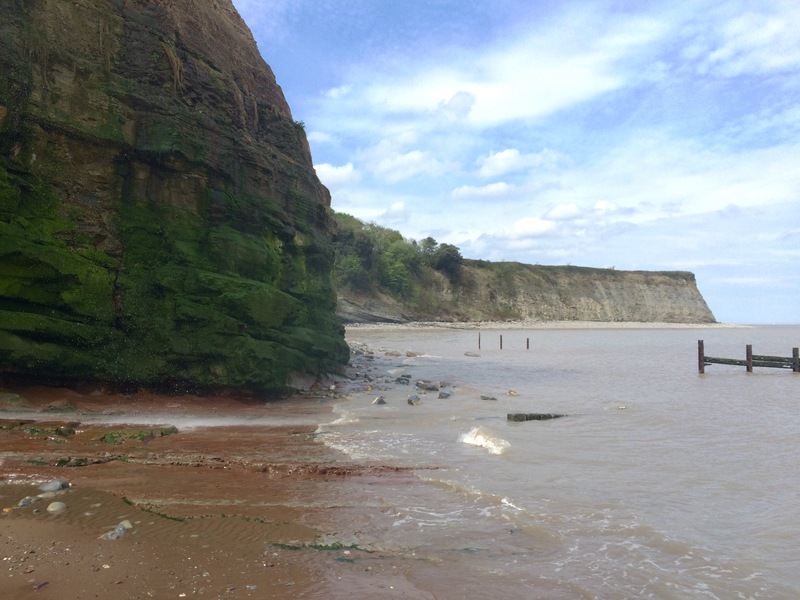 The cliffs here are the same Blue Lias type as across the water in Glamorgan and make interesting patterns. who laid block paving on the beach? 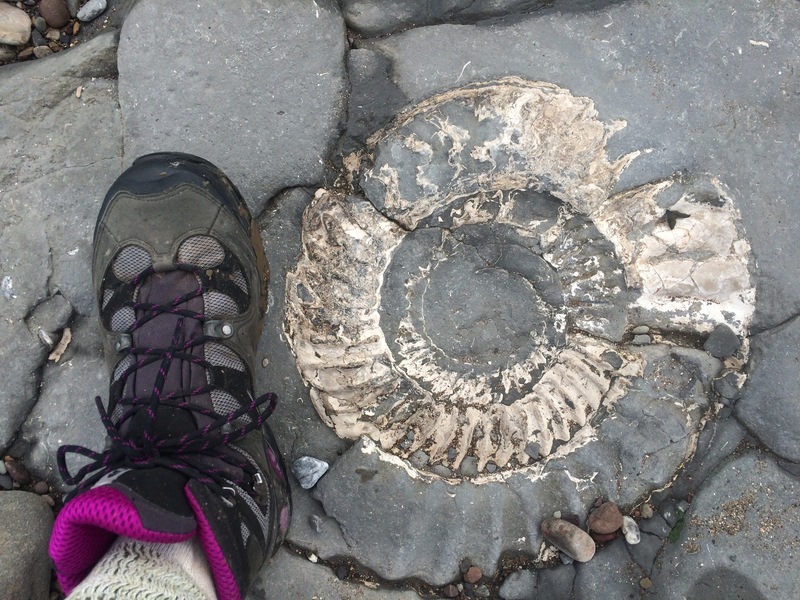 Doniford Bay is known for its Jurassic fossils, particularly ammonites, and I saw a few embedded in the rocks. I was hungry so I thought of food and suddenly I was in front of Doniford Farm Park, which had a tea room. Now that’s Trail Magic! I stopped for afternoon tea, complete with Whortleberry jam. 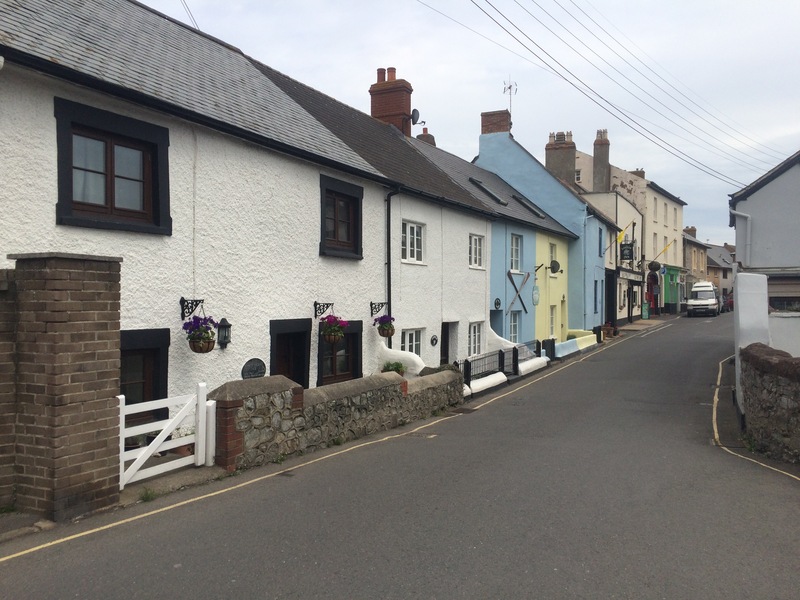 Watchet was a pleasant little town. I briefly looked in at the Market House Museum, one of 3 museums in the town. Yankee Jack, a sailor and shantyman who wrote many well-known sea shanties, was from Watchet. 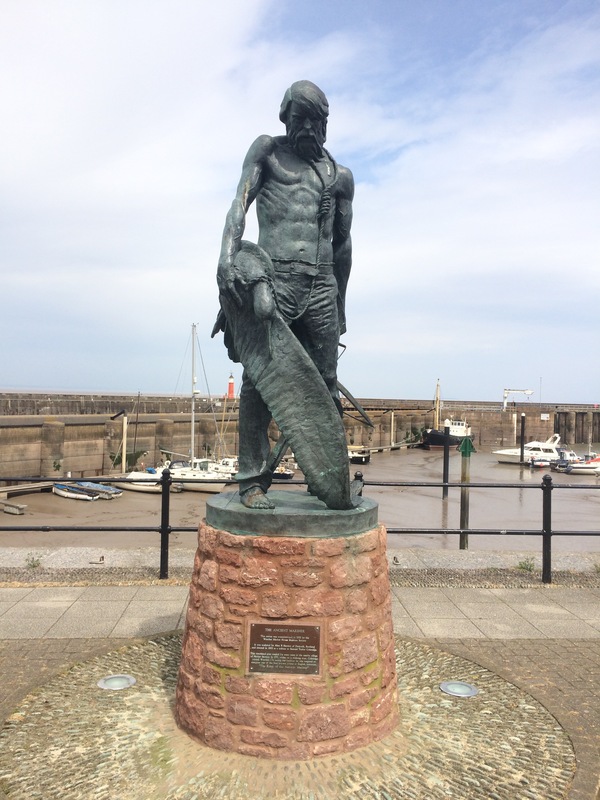 Watchet harbour was also the inspiration for Samuel Taylor Coleridge’s The Rime of the Ancient Mariner. The West Somerset Steam Railway runs through Watchet and along the coast to Minehead. The mineral line was opened in 1857 to transport iron ore mined in the Brendon Hills to Watchet harbour. From there it was shipped to S Wales for smelting in the Ebbw Vale furnaces. 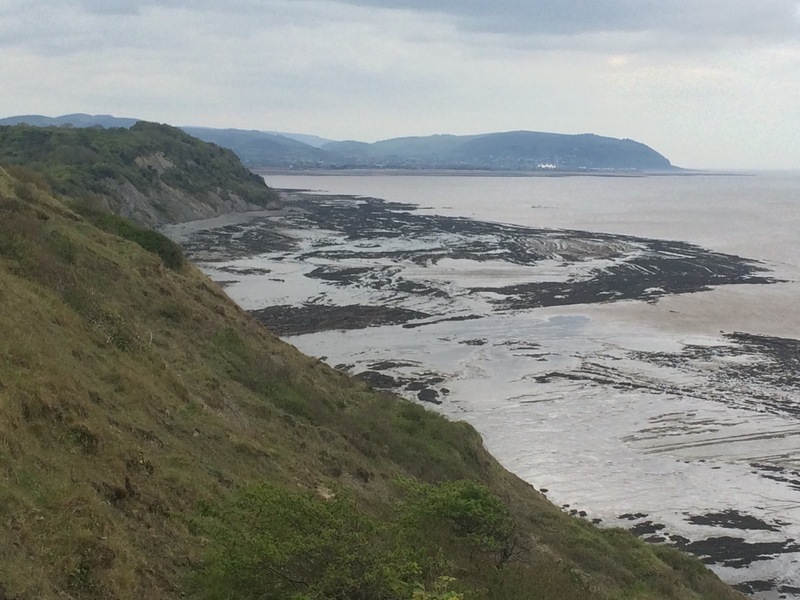 Unfortunately the train wasn’t taking passengers today so I had to walk to Minehead. 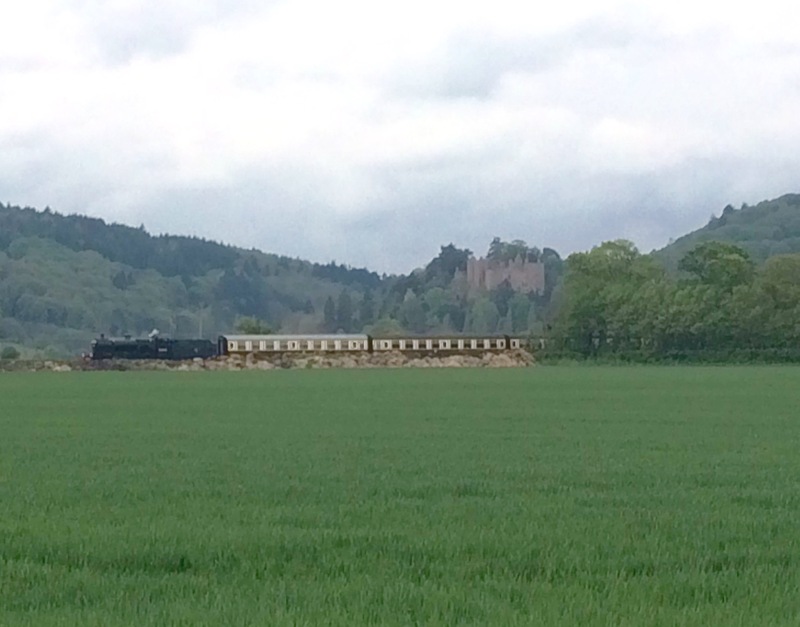 I did see the train as I was struggling along the shingle by Dunster Beach. 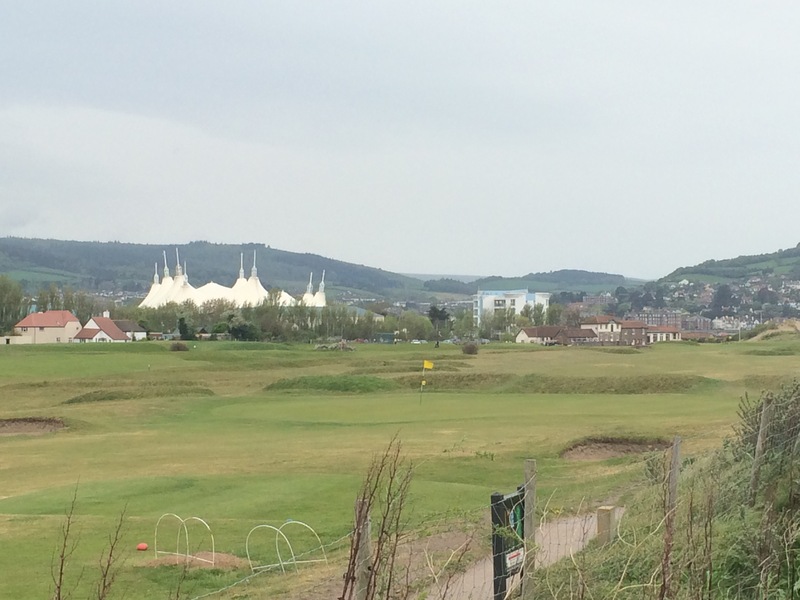 The view of Minehead is dominated by the big top style tent at Butlins Holiday Park; however, around the other side of the bay the town seemed quite different. I was staying in a lovely inn on the quayside. There had been spots of rain all afternoon but nothing much. Heavy rain was still on the forecast for overnight. 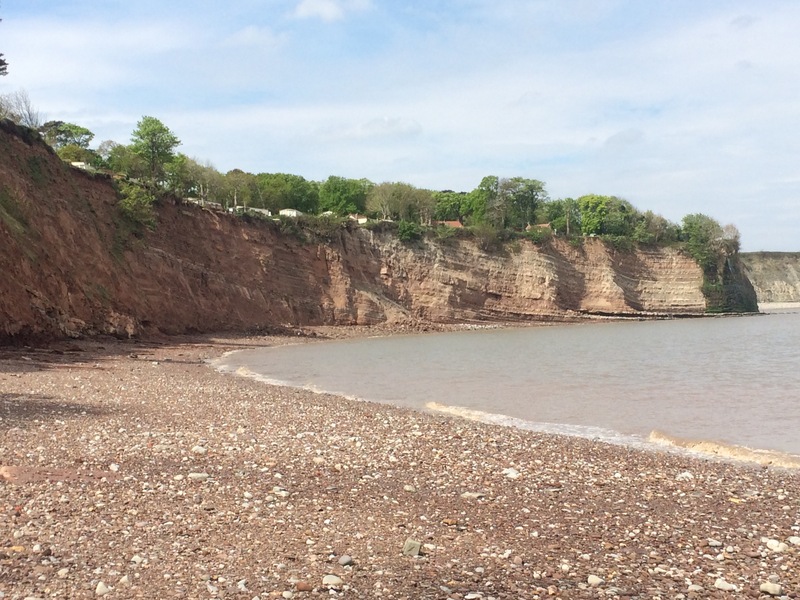 Seaside Steve can be added to your ever increasing number of unusual acquaintances…..along with a day full of memories and beautiful views….well done Juice lovely lovely blog. On top of all that you are another 18 miles closer to Tower Bridge. What is Trail Name going to be? I have a few suggestions as do your other followers I am sure. Take care be safe. Seaside Steve… Hmmm. He makes your trip sound rather tame. I am wondering if you will take on a similarly serious feat when you retire next time?! Seaside Steve hey? What u gonna call yourself? Long way round Lucy?!! Cant imagine that tent of his being warm, cosy or dry! Hi Caroline. I reached Polkerris last Saturday and popped into your gallery hoping to meet you. Lovely little beach. 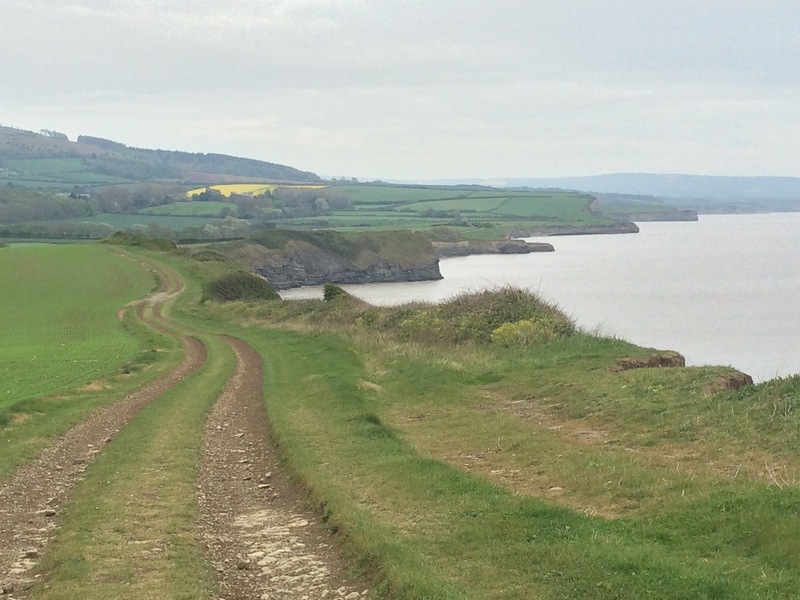 Hey there, I just walked 466 miles of SW coastal path and Met Seaside Stevie south of Bude. 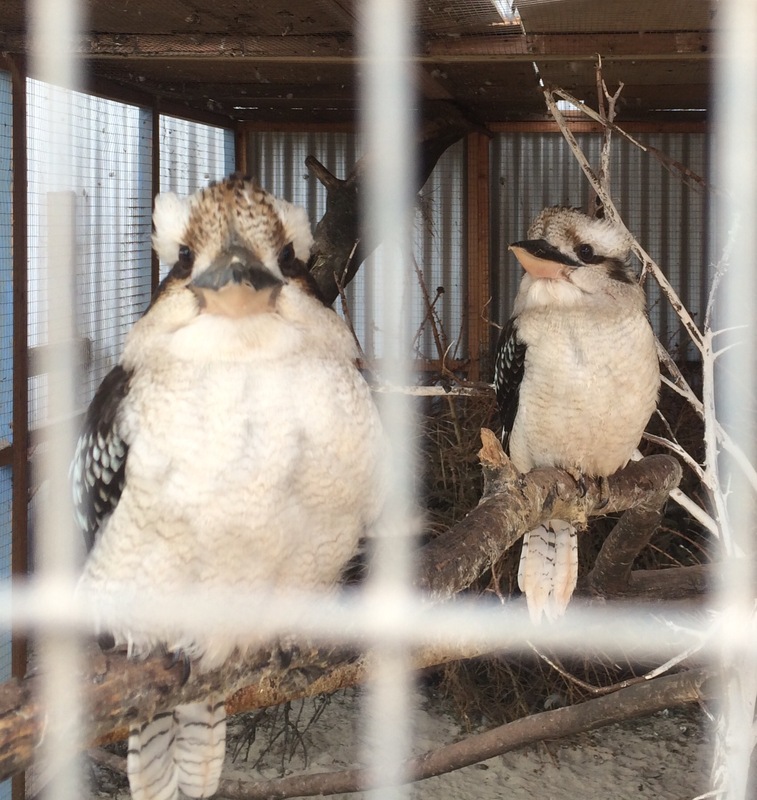 He talk to me about Trail angels and Trail Magic as well. He was fantastic and I was at a bit of a low point when I met him and he really helped me along. Had to Google him when I got back and found your blog! Happy walking with lots of Trail magic and angels!